One of seven children of a high-ranking government official, Loung Ung lived a privileged life in the Cambodian capital of Phnom Penh until the age of five. Then, in April 1975, Pol Pot's Khmer Rouge army stormed into the city, forcing Ung's family to flee and, eventually, to disperse. 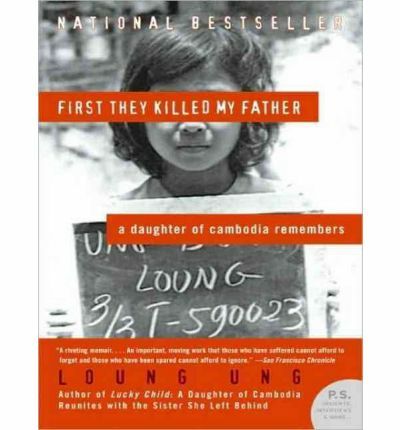 Loung was trained as a child soldier in a work camp for orphans, her siblings were sent to labor camps, and those who survived the horrors would not be reunited until the Khmer Rouge was destroyed.Harrowing yet hopeful, Loung's powerful story is an unforgettable account of a family shaken and shattered, yet miraculously sustained by courage and love in the face of unspeakable brutality. About the Author: Loung Ung is a national spokesperson for the Campaign for a Landmine Free World, a program of the Vietnam Veterans of America Foundation, and the author of Lucky Child: A Daughter of Cambodia Reunites with the Sister She Left Behind. Loung lives with her husband in Ohio. Producer Tavia Gilbert is an AudioFile Earphones Award winner, an Audie Award nominee, and a Parent's Choice Award winner. She makes her home in Portland, Maine, where she works as a writer and a stage and voice actor. Tavia produces, directs, and narrates unique audiobooks, full-cast recordings, and documentaries, and she is currently pursuing an M.F.A. in creative nonfiction at the Vermont College of Fine Arts. Note: This AudioBook is in mp3-CD data format. This signifies it will only play on CD players especially equipped to play mp3-CDs. It also can be loaded onto a computer and cloned over to assorted mp3 players and played on them.